The county’s Air Pollution Control District (APCD) will soon establish its own greenhouse-gas emissions ceiling, with its Board of Directors — each of the five county supervisors and an elected representative from each of the eight incorporated cities — set to pick a limit at a special meeting on April 30. On Thursday, the board had another special meeting to discuss the thresholds on the table. A concurrent process has also been playing out over at the county’s Planning and Development department, whose threshold would apply to new oil and gas projects, among other new stationary pollution sources. Last week, the Planning Commission voted in favor of imposing an annual limit on projects of 1,000 metric tons, meaning that companies whose projects surpass that would need to buy reduction credits. The Board of Supervisors will have the final say on that limit on May 19. 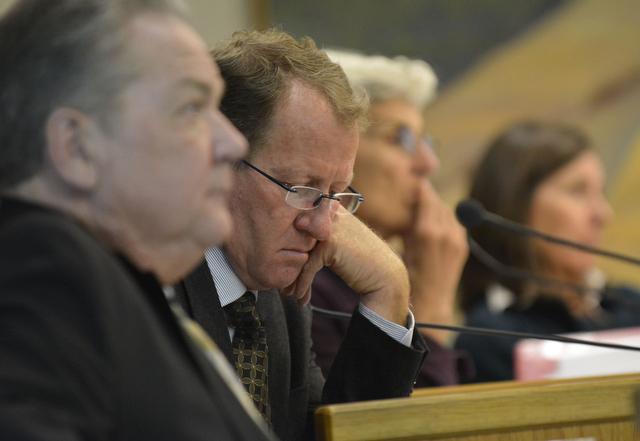 Santa Barbara County planning commissioners Daniel Blough (left), Larry Ferini, Joan Hartmann, and Cecilia Brown listen during public comment on the greenhouse-gas emissions threshold issue on April 9. Whatever limit the APCD goes with would apply to new or modified stationary sources under that agency’s purview, such as if an existing project were to propose a change that would require a new APCD permit but not further land-use review. The APCD’s ceiling would also be encouraged for use by other jurisdictions in the county that don’t have a pollution threshold of their own. On April 30, the APCD board will have two options before them, although their advisory panel — composed of community members with various backgrounds, including oil industry officials and environmental activists — has recommended one over another with a 15-7 vote. One option would be to hold projects to 10,000 metric tons — equal to the emissions from 2,105 cars — per year, the same limit imposed by the Board of Supervisors in 2013 on Santa Maria Energy’s bid for 136 cyclic-steaming oil wells. The 10,000-ton ceiling is also in place at several air quality agencies throughout the state, including San Luis Obispo County’s. The option preferred overwhelmingly by the board’s advisory panel would see polluters that emit between 10,000 and 25,000 metric tons forced to scale back by 15.3 percent. (Projects that belched out more than 25,000 metric tons would have to participate in the state’s cap-and-trade program.) That option would be in line with the state’s Global Warming Solutions Act (AB 32). Passed in 2006, AB 32 aims to reduce California’s pollution levels to 1990 figures by 2020, and as such, requires that energy projects cut back by at least 15.3 percent. If chosen, that percentage cutback would also be amended as AB 32’s goals change over time. The APCD board doesn’t typically meet every month and wasn’t originally scheduled to in April. Thursday’s special meeting came out of the group’s March 19 hearing, with Supervisor Peter Adam suggesting the get-together. If the decision were to wait until the board’s next regularly scheduled meeting in May, it would come two days after the Board of Supervisors is set to choose the threshold to be used by the county. It was later speculated that Adam wanted to have the APCD’s limit in place ahead of the supervisors’ vote in order to have something to point to during that deliberation. But Adam’s March motion for the April 16 meeting didn’t specify that the board had to make a decision that day, which neutered Thursday’s meeting to discussion-only and prompted Adam to motion for a decision to be made on April 30. That move tweaked Supervisor Janet Wolf, who noted that several APCD board members — including fellow supervisors Salud Carbajal and Doreen Farr — won’t be able to attend the April 30 meeting. “I can’t speak for what’s in your heart, Mr. Adam,” Wolf said, “but I can’t believe that you would think this process is fair.” A brief back-and-forth between the two ensued, with Adam saying, “Don’t cast stones at me but they’ll be coming back” and Wolf responding, “Well, I’ll catch them.” Ultimately, the APCD board voted 7-6 to return on April 30. As has been the case at the county’s hearings on that emission limit, community members expressed divided views on which ceiling to set. Oil industry representatives spoke strongly in favor of the 15.3 percent reduction. “We get that we are an industrial, intensive use in a very beautiful area,” said Ben Oakley, the environmental coordinator for ERG Operating Company, currently vying to drill 233 new cyclic-steaming wells here. But, Oakley continued, the company takes its “stewardship” responsibility seriously. Speaking to the legal standing of the 15.3 percent option, Senior Deputy County Counsel Bill Dillon noted two court cases — both of which involved emissions released from big-box stores — where a ceiling tied to AB 32 has withstood challenge. Both cases, Dillon said, have been “very deferential” to that type of threshold given its consistency with the state law.